San Diego, CA – March 22, 2019 – Unisyn Voting Solutions, Inc. (Unisyn) has created a new staff position and is proud to announce its recent hire of Mr. Brian Hancock who has joined their team to fulfill this position as Director, Infrastructure Policy & Product Development. He will also work closely with Unisyn’s management and engineering team to develop new products. Mr. Hancock brings to Unisyn over 30 years of experience in the voting industry. He is recently retired from the United States Election Assistance Commission (EAC) where for 14 years he served as a Director of the Voting System Testing and Certification Division. During his tenure with the EAC, he also had responsibility for working with the National Voluntary Laboratory Accreditation Program (NVLAP) of the National Institute of Standards and Technology (NIST) to accredit independent testing laboratories, and for overseeing the development and maintenance of the EAC’s Voluntary Voting System Guidelines (VVSG). Unisyn Voting Solutions, Inc. is dedicated to helping government institutions and private entities optimize their election programs and provide best-in-class service. Our innovative approach enables us to deliver election systems and products that are secure, auditable, flexible, and provide transparency. 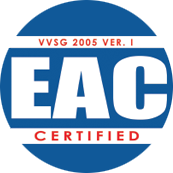 Unisyn’s OpenElect® suite of products have been certified to the 2005 VVSG Certification from the Help America Vote Act guidelines as set forth by the EAC for a digital optical scan voting system, and they are built on a Java and hardened Linux platform. Unisyn makes code available for review by trusted election officials as part of a procurement process. As a wholly-owned subsidiary of International Lottery & Totalizator Systems, Inc., Unisyn also designed the InkaVote Plus precinct ballot counter which is currently used in Los Angeles County, California.